لا توجد تقييمات كافية عن الطعام أو الخدمة أو القيمة أو البيئة فيما يتعلق بمطعم ‪Submarina Subs & Sandwiches‬, كاليفورنيا حتى الآن. كن واحدًا من أوائل من يكتبون تعليقًا! oven roasted chicken, ham, bacon, fresh greens. oven roasted chicken, jalapeno bacon, avocado, fresh greens. turkey breast, bacon, avocado, fresh greens. solid white meat tuna (dolphin safe) served on garden fresh greens with your choice of dressing. Choose Any One Or Two Below On Your Choice Of Fresh Baked Bread. all white meat turkey breast, crisp bacon, sliced ripe avocado and your choice of cheese and fresh veggies. all white meat chicken breast strips, cheese. ham, prosciutto, capocolla, salami, pepperoni, cheese. oven roasted chicken, avocado, cheese. premium hand sliced chicken breast topped with crisp jalapeno bacon, melted pepper jack cheese and sliced ripe avocado. crisp bacon, lettuce, ripe tomato. roast beef, swiss, au jus. peppered turkey, pepper jack cheese, chipotle mayo. traditional meatballs, marinara sauce, melted cheese. 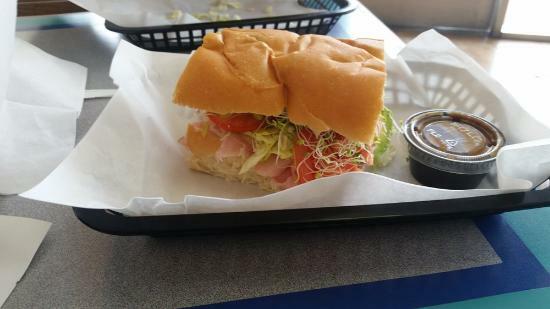 whole slices of ripe avocado, premium all white meat turkey breast, provolone cheese and garden fresh veggies on your choice of freshly baked artisan bread. solid white albacore tuna salad, cheese. turkey breast, ham, bacon, swiss. oven roasted chicken, ham, bacon, swiss. avocado, roast beef, smoked cheddar. ham, turkey breast, roast beef, cheese. ham, mortadella, salami, pepperoni, cheese. roast beef, jalapeno bacon, pepper jack. هذه الساندويتشات القنبلة! اللحم والجبن شرائح قبلك الساندويتشات محمصة قابلت جميع melty. أيضا شوربة الطماطم المشوية الثوم! لذيذ. أتمنى أن لديهم في تكساس. كان للمكان. احصل على إجابات سريعة من موظفي ‪Submarina Subs & Sandwiches‬ وزوار سابقين.